Here’s an unhappy anniversary. On July 11, 1940, “Vichy France” was created. Formally the French State or État français, it was the Hitler’s-gun-to-your-head successor to the hapless Third Republic. I don’t see what else French politicians or citizens could have done at that point. But what a bitter pill to swallow. Pétain himself seems to have regarded the 1940 defeat and establishment of Vichy as a chance to reverse the liberalism of the 1930s, such as it was, cracking down on the independence of women, unions and businesses, and instituting central planning. I once heard a surprisingly plausible conspiracy theory about the poor French military performance in the Battle of France, that the generals were aiming for temporary setbacks to discredit those miserable liberal politicians, create an authoritarian regime and then recoup their battlefield losses. If so it was an appalling miscalculation. But it’s kind of creepy that Pétain rather proceeded as though it had worked, apart from the bit where Hitler captured Paris. Meanwhile ordinary Frenchmen and Frenchwomen seem to have felt, by and large, that Vichy was the best chance they had to preserve at least some autonomy given the catastrophe. So here’s the hard part. Suppose you’re French in June 1940. What do you do. Ideally you are privately busy joining La Résistance or “Résis” even though the French government had never allowed their citizens the right to bear arms and only realized too late that they needed it (a story for another day, on which see www.arighttoarms.com). But obviously you can’t tell a Panzer tank sorry, go away, I’m part of the Underground. So you have to sign an armistice on terms the Germans dictate, or accept the armistice, and pretend to back the resulting government. And then you have to seem to collaborate. But before you know it, you are collaborating. A tactic becomes a strategy and suddenly it becomes reality. A nasty case in point is the oily Pierre Laval, a Third Republic leftist who made a slick transition to Prime Minister of Vichy from 1942-44 and was shot after the war. 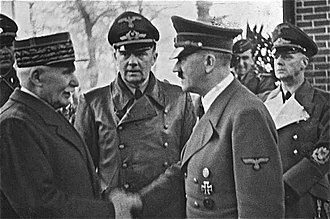 Vichy France did collaborate with the Nazis in the persecution of Jews, both as official policy and in some cases from private conviction. After the war a lot more people joined the “Résis” than were ever part of it during the conflict. But what else can you do besides keep your head down and go along with what’s happening, albeit unenthusiastically? Yet how can you do it? Unless you are a genuine anti-Semite and possibly an ideological sympathizer with Naziism, it’s a horrifying dilemma (and if you are, you’re just horrifying). In June 1940 the war was lost and if you were in a position of power you had a very real moral obligation to surrender to prevent a lot more killing before the Germans found someone who would surrender to stop it. Then you had to govern the way they told you so they didn’t start killing people again. Except to govern the way they told you meant killing people, including Jews, opponents of Naziism and pretty much the people you least wanted to kill. Once you’re on that slippery slope, I don’t see where or how you get off. But how do you not get on it? Well, the obvious answer is don’t lose the war. Since I don’t see a less obvious one, the lesson is don’t be caught unprepared. Don’t dismiss people who sound the alarm about national security as warmongers, and insist on spending all the money on left-wing causes that undermine the economy, social cohesion, and a sense that your society is worth defending. Which uncomfortably is not just a lesson for France in 1940.